MC Ajele will always be grateful to the school he attended and the environment he was as a kid. Naïve of what he was doing as a juvenile, he attends jest competition for fun. Mc Ajele has now become official MC for many corporate organizations. Born into the family of Olaoluwa and Titilope Ajele on July 21, 1986 in Lagos state and named Adeyemi Abimbola Ajele. Adeyemi Ajele is an indigene of Ondo state and Ese-Odo Local Government precisely. At the age of 16, he relocated to Ondo state due to death of his father to finish his secondary school education. In his new environment, he was quickly known as a boy from Lagos with clowning endowment. Consequently, he was always called upon to anchor parties in town and social gatherings in school. In 2006, while working as a KAI officer in Lagos, he met Emeka Smith through his colleague, Daniel Oyelani. 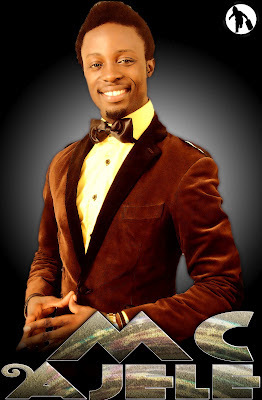 Under the tutelage of Emeka Smith he got to know more about standup comedy and what is required on stage. Later in 2006, MC Ajele organized an event tagged ‘Laff and Roll’ in Goddis Garden, With the support of Gbenro. The show turned out to be an unsuccessful one because it was clumsily organized and fans didn’t show up as planned. Therefore, not having much people to “laff and roll”. He, afterwards, undertook ‘Open Mic’ competition organized by AY to test his standup comedy accomplishment, the period his career took a new turn. What worked for MC Ajele while growing up didn’t work for him in this competition. According to record, MC Ajele has been on ‘Open Mic’ stage thrice but never won any. He wasn’t discouraged by not winning because he has a vision that exhorts him. The competition seems like the seasoning required to spice up his career, ‘Open Mic’ was the school of comedy he attended. He became confident, more creative and original as a result of all the testing he went through. The competition, where many felt he failed made him the comedian he is. MC Ajele has performed at events like Global Excellence Couples night, MTN Project fame, Nigeria Photography award, National Mirror Award, Mimiko 3rd year anniversary, Nigeria Media Award, African Parliamentary Award, Kingdom Africa Launching, Miss UNILAG, Winners 30th Anniversary, M2 Award and Kennis Music Club Tourto name a few. He is a JCI Ambassador and official MC for many brands. He looks up to the likes of AY for his creativity, Basket Mouth for his hard work, SeyiLaw for his versatility and Emeka Smith for his aggression. MC Ajele has been able to stage his own personal show, which turned out to be a successful one, titled ‘Laff 4 nuttin’ and was packaged by IKENGA Entertainment.